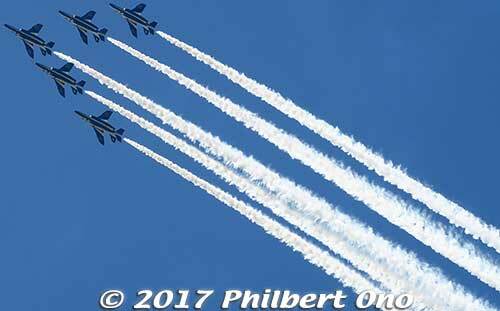 I went to see it a few days after it started. It’s basically a series of special exhibitions held in three castle buildings. Compared to 10 years ago, they have a lot more English captions. It’s part of Hikone’s push (since 1992) to have Hikone Castle designated as a World Heritage Site. The English is not perfect, but better than nothing. 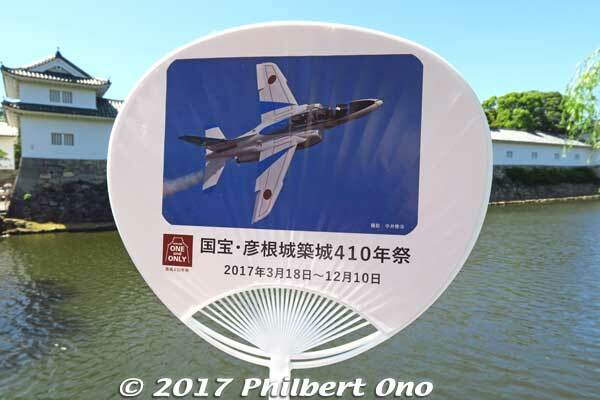 It’s strange that they have English explanations in the exhibitions and videos, but no English in their PR materials and PR website for the 410th anniversary. (Usually it’s vice versa: PR info in English, but no English captions.) 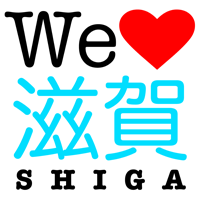 They even created a slick Japanese PR video that went viral even in Japan’s English-speaking world, but without any followup in any foreign languages. Such a pity. And so, I’m writing this overview of the 410th anniversary because no one else has done so in English. 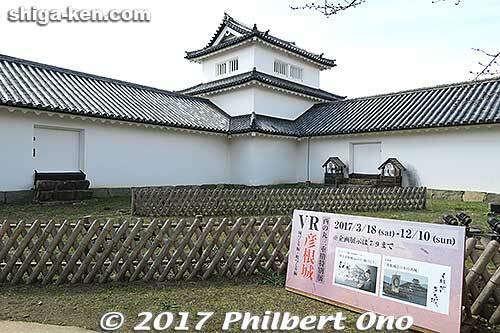 Hikone Castle’s 410th anniversary exhibitions (and videos) are inside these three castle buildings: Kaikoku Kinenkan museum, Tenbin Yagura Turret, and Nishinomaru Sanju-yagura turret (photos below). 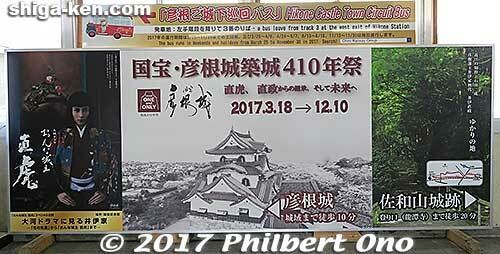 The other castle buildings such as the main castle tower and Hikone Castle Museum have nothing related to the 410th anniversary. 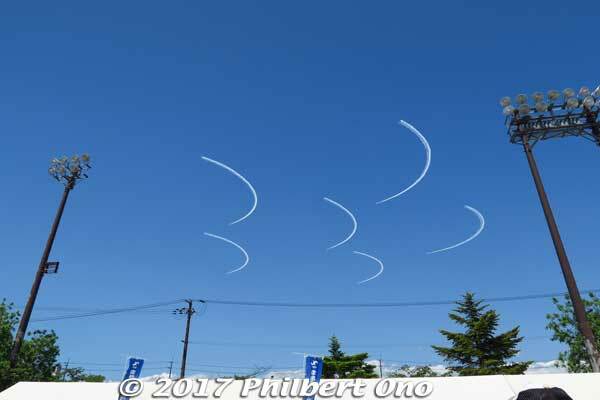 They remain the same as usual. 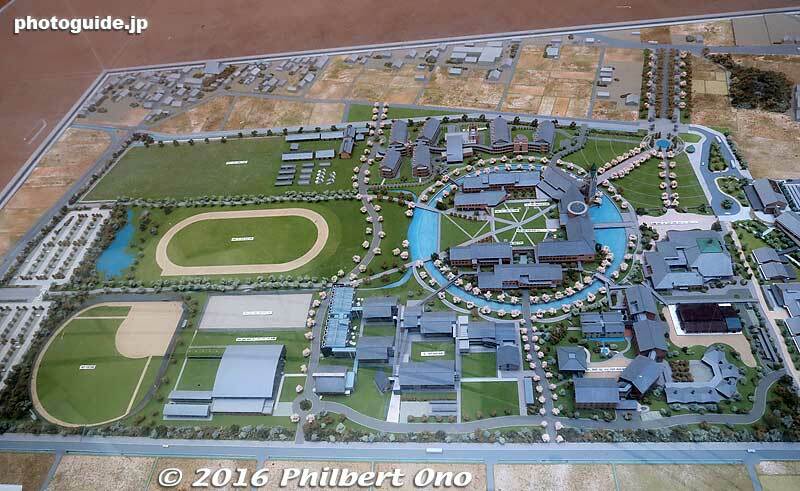 There’s no new mascot either. 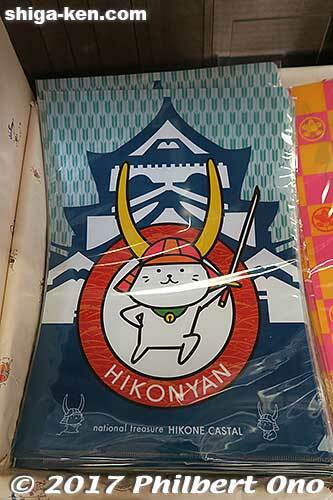 The city is already happy with the nationally famous Hiko-nyan, a holdover from the 400th anniversary 10 years ago. That must’ve reduced the anniversary’s cost to the city. 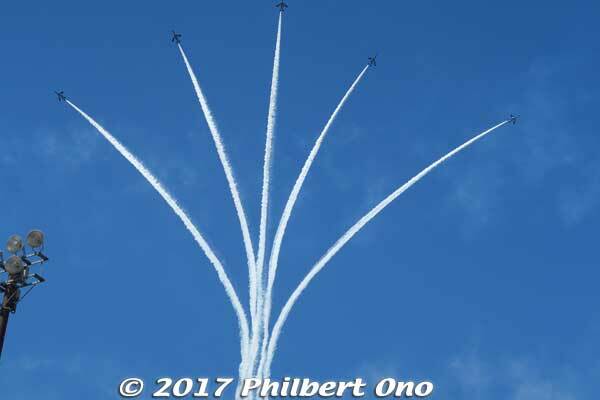 On June 4, 2017, as part of the 410th anniversary, the Blue Impulse aerobatic team of the Japan Air Self-Defense Force performed in the skies of Hikone. 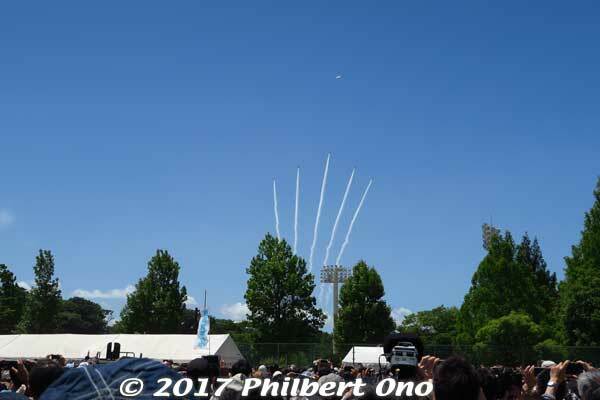 On Blue Impulse day, Konki Park near the castle where they had a stage and food booths. Lines for food were ridiculously long. Dusty too. Good view of the castle (toward the right). but the planes never flew near the castle. Blue Impulse drawing in the sky above Hikone. 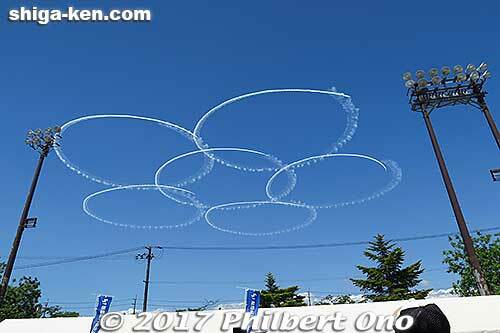 Cherry blossoms in the sky! 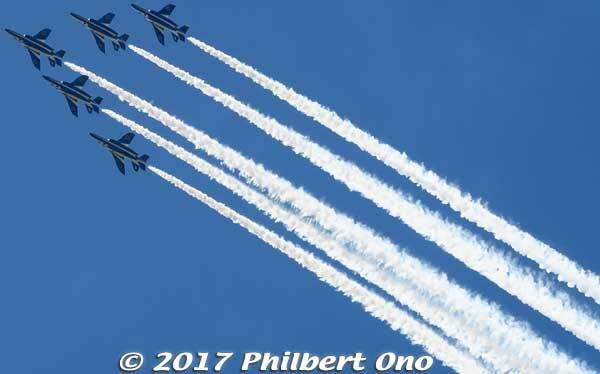 Thank you Blue Impulse for performing in Shiga for the first time. 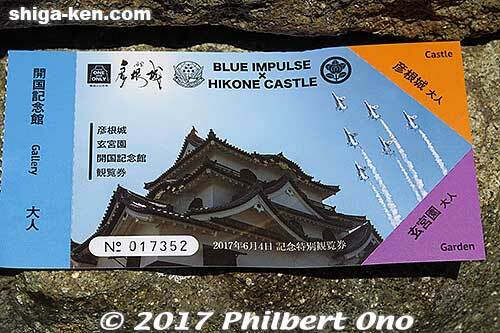 Special edition Hikone Castle admission ticket sold only on June 4, 2017, Blue Impulse day. There’s no extra fee to see the 410th anniversary special exhibitions and videos. 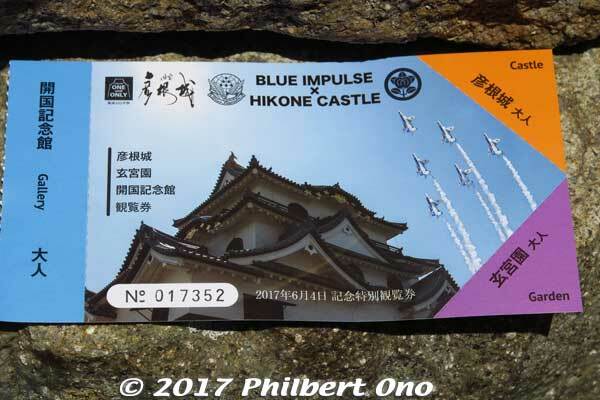 You just pay the normal castle admission of ¥1,500 which includes admission to the castle, Hikone Castle Museum, Kaikoku Kinenkan museum, and the adjacent Genkyuen Garden. 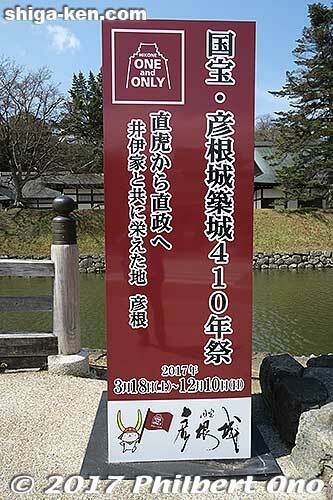 If you want to skip the Hikone Castle Museum, the admission is ¥1,000. Allow at least 2 to 3 hours to visit the castle, museums, and garden. Note that the Genkyuen Garden pond is being repaired in March–April 2017 so the water might be drained. 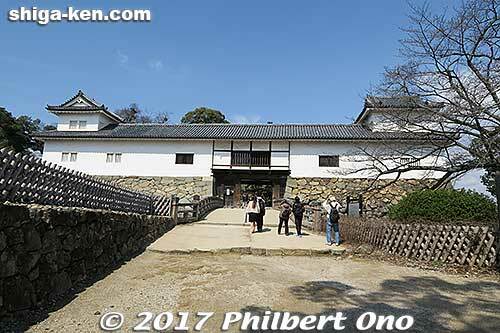 Hikone Castle is a short walk from JR Hikone Station (JR Tokaido/Biwako Line), an easy day trip from Kyoto, Nagoya, Fukui, and Gifu. Kaikoku Kinenkan museum. Entrance is on the other side. Kaikoku Kinenkan museum (開国記念館) is one of the first buildings you will see and pass by when you reach the castle from Hikone Station. It’s in the reconstructed portion of the Ninomaru-Sawaguchi Tamon Yagura Turret. It’s modern on the inside. Instead of entering this museum first, it might be better to enter it last on the way back to the train station. 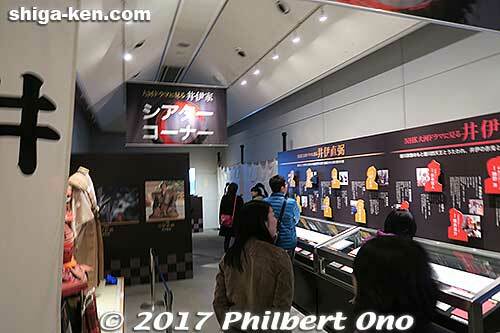 Besides regular exhibits (like a scale model of Hikone Castle town), Kaikoku Kinenkan museum’s special exhibition is about the NHK Taiga Drama TV series that featured the Ii Clan (mainly Ii Naomasa or Ii Naosuke) from 1963 to 2017 (大河ドラマに見る井伊家 —「花の生涯」から「おんな城主 直虎」まで—). It is in tandem with the current NHK Taiga TV drama series, Onna Joshu Naotora about Hikone Castle founder Lord Ii Naomasa’s adoptive mother Ii Naotora (1536?–1582) who was a 16th century female daimyo and castle lord in Iinoya, Hamamatsu, Shizuoka Prefecture. The room has panel displays, videos, and costumes and implements used in past Taiga Dramas. Nothing is in English. Because of Naomasa’s closeness and loyalty to Ieyasu in winning the pivotal Battle of Sekigahara in 1600 that unified Japan, the Ii Clan enjoyed a prominent role in the Tokugawa government for generations until the 19th century. They also had a domain and residence in Edo (now Tokyo). 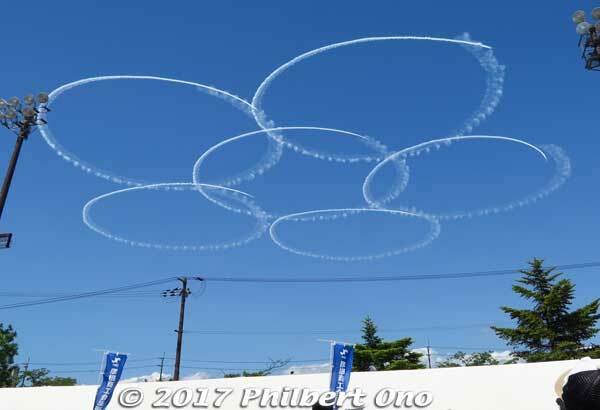 Because of this, the cities of Mito and Hikone had bad blood between them for many years until they officially reconciled in 1968 and became Friendship Cities. Statue of Ii Naomasa in front of JR Hikone Station. 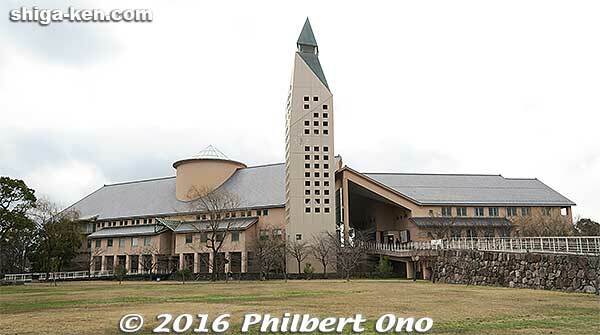 After the Kaikoku Kinenkan museum, you will pass by the Umaya Horse Stable and a gift shop. The horse stable, open to the public with a fake horse inside, is also a National Important Cultural Property and one-of-a-kind in a Japanese castle. 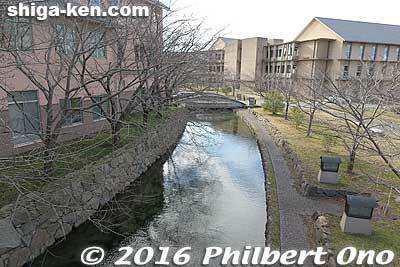 Cross the wooden bridge over the moat and you’ll see the castle ticket office and Hikone Castle Museum. Show your ticket and go up the wide stone steps. You’ll soon see the impressive stone wall and bridge of the Tenbin Yagura turret. Tenbin Yagura Turret. Entrance is on other side. 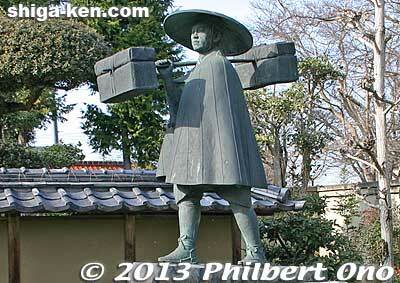 Tenbin Yagura is named after the luggage-carrying shoulder pole depicted on this traveling Omi merchant. The Tenbin Yagura Turret (天秤櫓), a National Important Cultural Property, is the second special exhibition venue for the 410th anniversary. It’s Hikone Castle’s second-most famous and important building. It has a pair of two-story watchtower turrets. They look almost identical and symmetrical, but they are not. 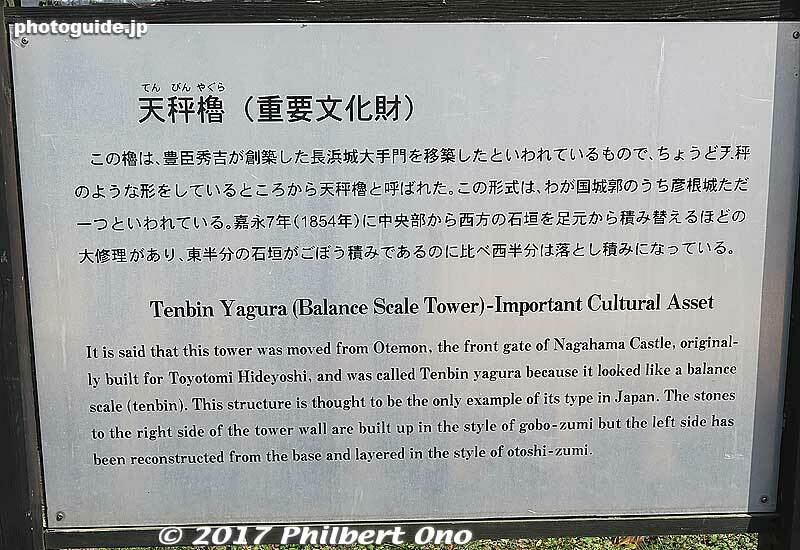 “Tenbin” in this case does not refer to a balance scale as mistranslated in the explanatory sign. It actually refers to its similarity to a shoulder pole or carrying pole with luggage on both ends (called tenbinbo 天秤棒). Many movies and dramas have been filmed around this historic building. To enter, you have to take off your shoes. 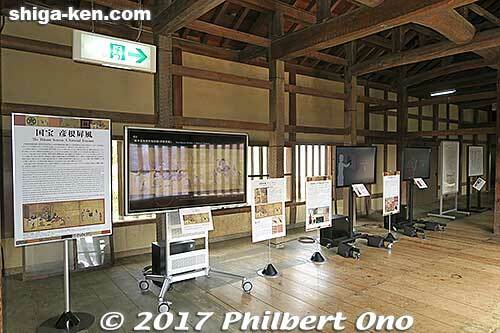 Until July 2: The Tenbin Yagura is showing has four large video monitors for a special video exhibition titled, Hikone and the World During the Edo Period As Seen Through Ii Clan Treasures (井伊家 家宝の魅力と江戸期の世界). Instead of displaying actual items, you only see video images of it. The good thing is that most everything has English captions. Screen showing Hikone Byobu amid glare. 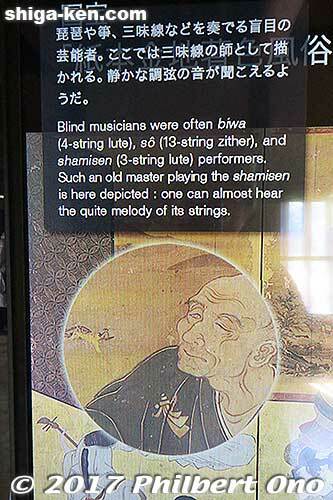 Hikone Byobu annotation appears when you move the magnifying glass with your finger. 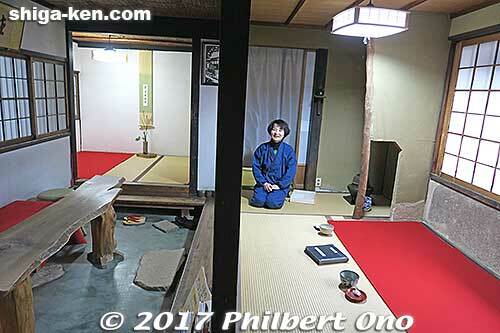 One video monitor shows the Hikone Byobu folding screen (彦根屏風) in detail. The Hikone Byobu is a 17th-century National Treasure painting on gold leaf. It shows a fashion-leading pleasure quarters scene in Kyoto. Shiga Prefecture has only four paintings that are National Treasures, and this is one of them and the only non-religious one. The others are all religious paintings owned by temples like Miidera. The six-panel byobu is dated to be from the Edo Period’s Kan’ei era (1624-44). It measures 271 cm wide and 94 cm high. Since it was kept by the Ii Clan for generations, the screen is nicknamed “Hikone Byobu” even though the painting is not related to Hikone. The city of Hikone owns the byobu (since 1997). The byobu’s National Treasure acclaim comes from the highly skilled and meticulous painting style and the myriad of people, fashion, and objects depicted from that era. Extremely fine lines and dots are painted for the hair, kimono patterns, etc. You’ll need a magnifying glass to see all that intricate detail. And this is exactly what the video monitor provides. It has a touchscreen virtual magnifying glass which you can move around on the painting displayed on the video screen. Use your finger to move the magnifying glass to magnify any part of the painting. When you move the magnifying glass over a point of interest, a pop-up caption appears to explain it in Japanese and English. It works well, but the English is a little sloppy. (The photo above shows “quiet” misspelled.) There’s also lots of glare from the windows facing the video monitors, making it hard to read. The video monitor has only two magnifying glasses so only two people can use it at the same time. The major disadvantage of this video display is that it shows the byobu painting completely flat. This byobu was actually designed to be viewed not as a flat painting, but as a folding screen with its characteristic zig-zag panels facing inward or outward. The people were painted to match the respective panel’s angle. The optical illusion shows people on adjacent panels angled or facing toward each other. Pretty neat. You can see this angle effect on the genuine Hikone Byobu displayed at Hikone Castle Museum from mid-April to mid-May every year. This year, it will be exhibited in the museum from April 14 to May 16, 2017. Read more about the Hikone Byobu here. Another video monitor shows treasures of the Ii Clan such as Noh masks and a palanquin. A third video monitor shows various Hikone sarasa (更紗) chintz fabrics owned by the Ii Clan. 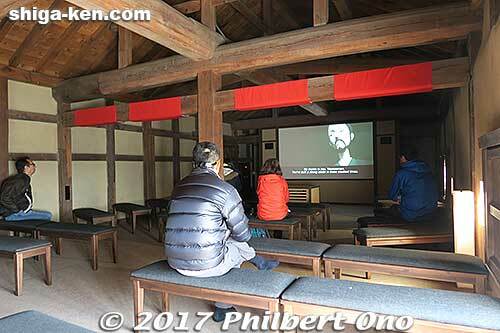 An adjacent room has a larger video monitor showing a short video about how Japan was depicted in old maps drawn by Europeans during the Edo Period and how the Ii Clan viewed the world outside Japan. This video has English subtitles. Note that the special exhibition inside Tenbin Yagura ends on July 2, 2017. I hope someday we will be allowed to go up the two turret towers as well. They are still closed to the public. From the Tenbin Yagura, there are some more steps toward the main castle tower. Choshoan tea house next to the bell. Gracious tea host inside Choshoan tea house. 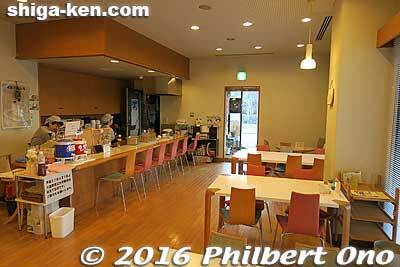 On the way to the main castle tower (tenshu), you can take a tea break at this small tea house called Choshoan (聴鐘庵). For ¥500, you can try matcha tea and a small confection. It’s operated by members of a tea school started by castle lord and tea master Ii Naosuke. At 12 noon and 3:00 p.m., you’ll hear the big “Time-Signal Bell” ringing right outside. The tea house was originally the bell ringer’s rest house. 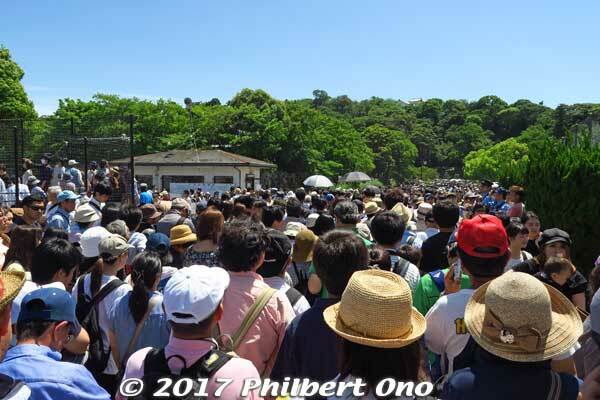 After having tea, go up just a few more steps and go through the Taikomon Gate to finally see the main castle tower, a National Treasure. 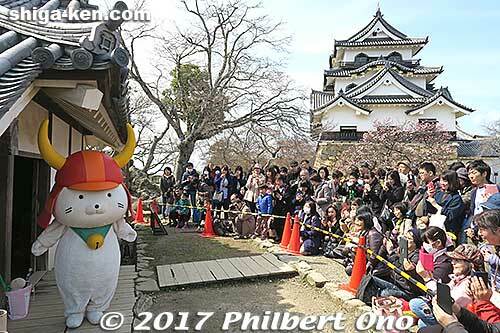 Hiko-nyan near the main castle tower at 1:30 p.m.
At 10:30 a.m. and 1:30 p.m. near the main castle tower and at 3 p.m. outside Hikone Castle Museum, you can see Hiko-nyan, Hikone’s nationally famous official mascot posing for tourists for 30 min. He is basically a white cat with a horned samurai helmet modeled after Naomasa’s helmet. Modeled after the beckoning cat, Hiko-nyan was created for the 400th anniversary in 2007. 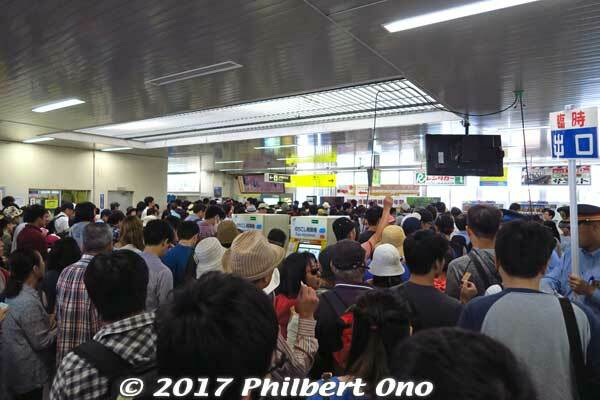 Back in 2007, the crowds came to see Hiko-nyan rather than the castle or the 400th anniversary exhibits. Hikone Castle’s tenshu main tower. If it’s not crowded (no people outside waiting in line), you can go up to the top of the tenshu (tenshukaku) main castle tower in a short time after going up a few steep stairs. (Take off your shoes when entering.) There’s no balcony outside, but the window views are nice. Hikone Castle’s main tower recycled parts of Otsu Castle and was brought here in 1606 and completed in 1607. However, the entire castle wasn’t completed until 1622 after 20 years of construction. 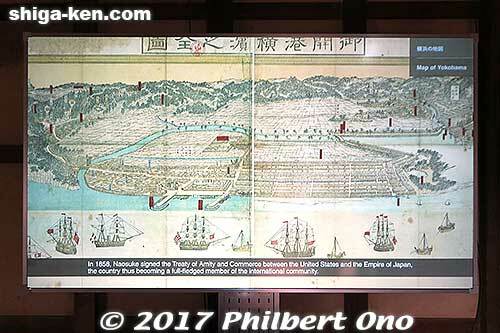 Since Hikone Castle was regarded as a strategically important castle to fend off any rebellious opposition from western Japan, its construction was a national project with labor and materials coming from other castles. 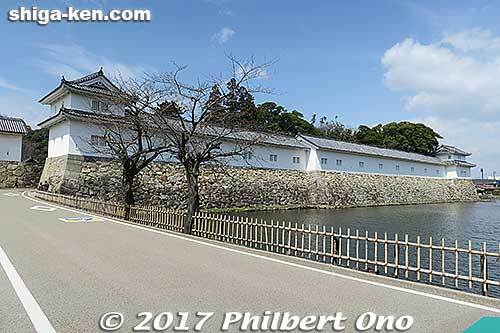 However, the Edo Period was largely peaceful and Hikone Castle was never attacked. Hikone Castle has one of the five main castle towers in Japan that is original and designated as a National Treasure. The others are Himeji, Matsumoto, Matsue, and Inuyama Castles. 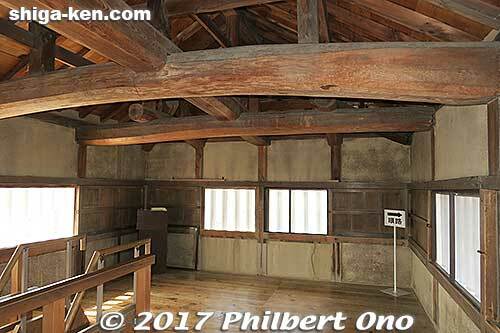 One reason why Hikone Castle’s main tower is a National Treasure is because it has many different types of roof features on one building (photo above). Its survival among the thousands of castles that have come and gone in Japan over the centuries is quite miraculous. 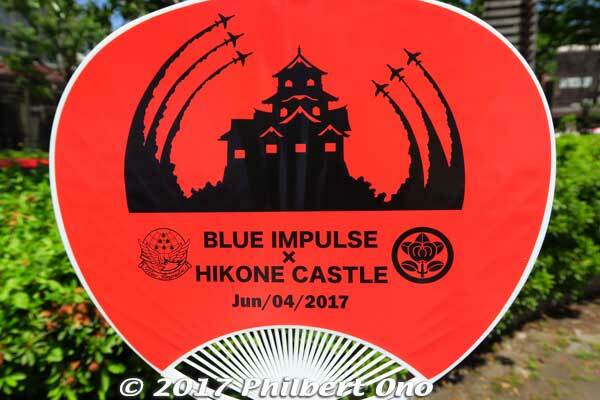 What with feudal wars, lightning-caused fires, earthquakes, Meiji Era decimation of feudal castles, and World War II bombings, Hikone Castle is still standing. 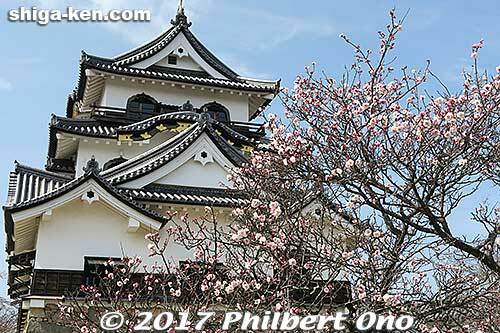 Hikone Castle’s main tower and plum blossoms in March. Although the tenshu main tower was the most prominent building, the daimyo castle lord did not live in it. 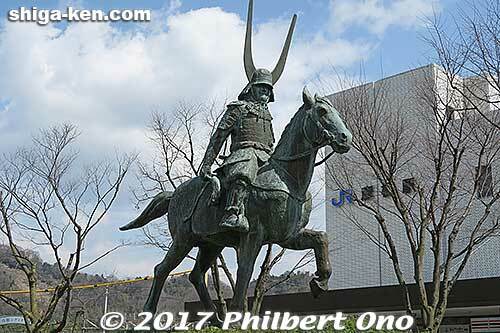 It was mainly a glorious symbol and storehouse for samurai armor and other artifacts of past Hikone daimyo. 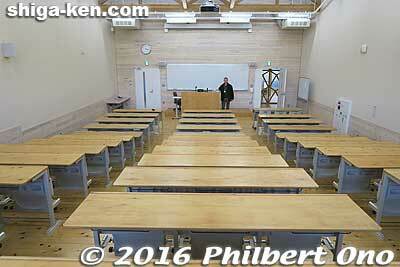 The castle lord’s residence (reconstructed as Hikone Castle Museum) was the palace at the foot of the mountain. After visiting the main tower, walk behind on the left to a park-like area anchored by the L-shaped Nishinomaru Sanju-yagura turret (西の丸三重櫓) on the far end. Nishinomaru Sanju-yagura turret faces the lake. You can also go up the three-story turret. Nishinomaru Sanju-yagura turret is the third and last venue of the 410th anniversary exhibitions. It is said to have been the tenshu castle tower of Odani Castle in Nagahama. To enter, take off your shoes. 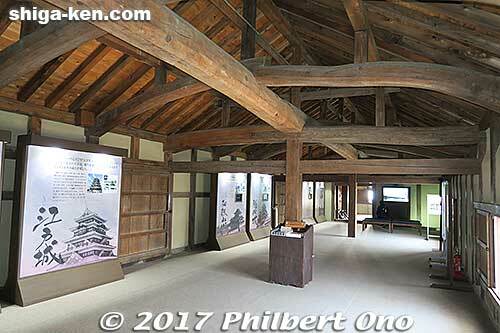 The first room has large panels explaining about other Japanese castles like Edo, Wakayama, Fukuoka, Yashimanoki, Iinoya, and Takamatsu which is Hikone’s sister castle since 1966. No English here. 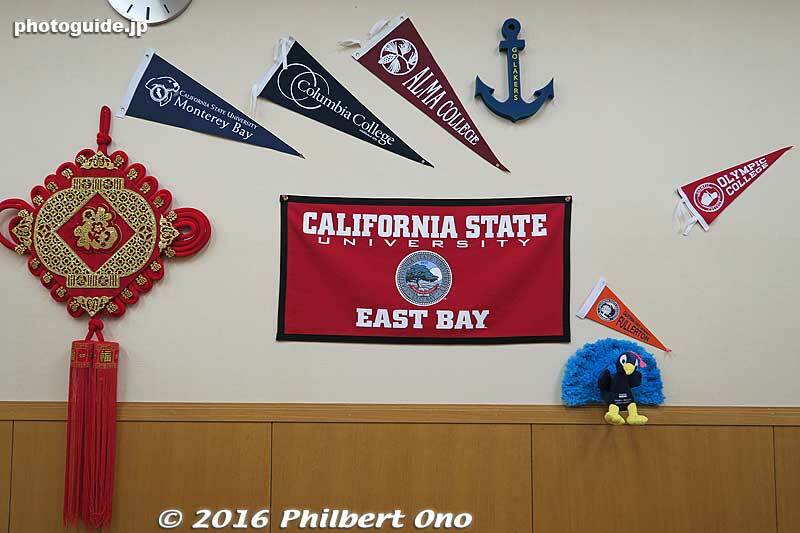 These panels will be displayed until July 9. 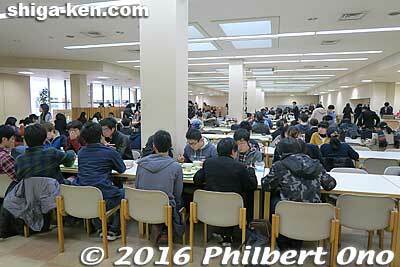 From July 13 to Dec. 10, this building will show scale models of Japanese castles. In the back room is a makeshift theater. 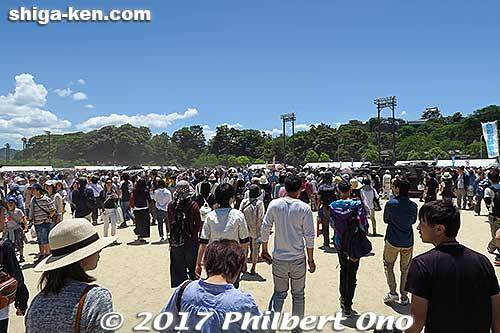 Nishinomaru Sanju-yagura’s main highlight is a 10-min. fictional CG anime about the design and construction of Hikone Castle, centering on the architect, Yasozaemon. English subtitles provided, but not perfect. 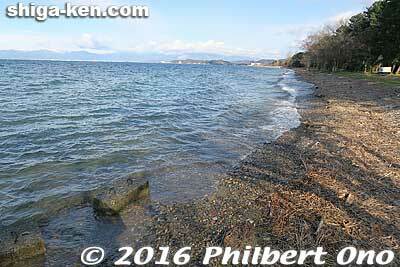 For example in the video, naiko (内湖) was translated as “Lake Naiko.” It’s not the name of any lake, it’s just a generic word for an attached lake on the fringe of Lake Biwa. 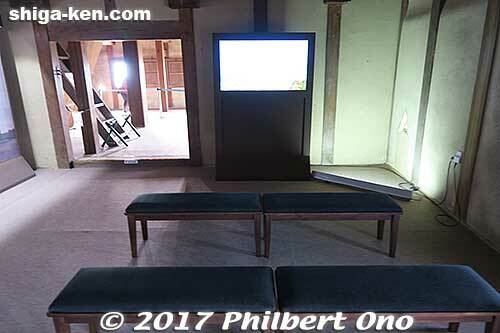 There will be a Part 2 video about the building of Hikone’s castle town that will be shown at from Aug. to Dec.
More short videos of castles. There’s also a smaller video monitor showing short videos of other castles. Most impressive was the CG animation of what Azuchi Castle may have looked like. Super gorgeous castle. It’s so sad it was attacked and set afire three years after it was completed. After seeing the exhibits and video, go up the three-story turret tower via steep stairs. Top floor of the three-story Nishinomaru Sanju-yagura. View of the lake from the top of the three-story turret. 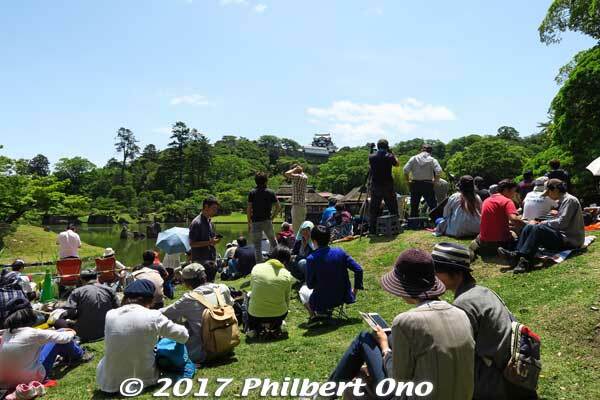 Nishinomaru Sanju-yagura turret has the closest views of the lake. No balcony, but windows are open (if it’s not raining). All these 410th anniversary special exhibitions and videos are good, but probably do not live up to the hype and viral PR video. The special exhibitions might not be a must-see, but Hikone Castle is a must-see. 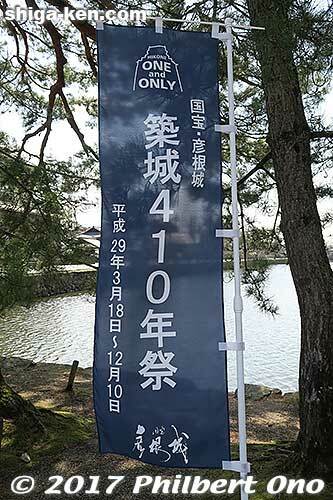 if it will be your first visit to Hikone, the special exhibitions will add a nice touch. I hope this post will help you understand the 410th anniversary and castle better. 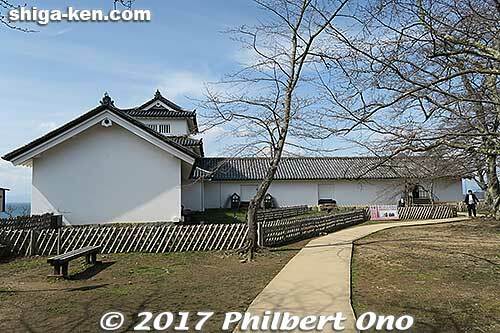 Hikone Castle photos – Over 280 photos of Hikone castle. Genkyuen Garden – Castle garden next to Hikone Castle. 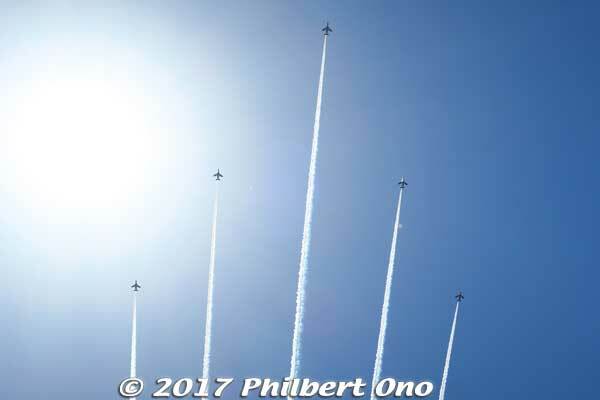 Hikone Castle Festival Parade – Held on Nov. 3. 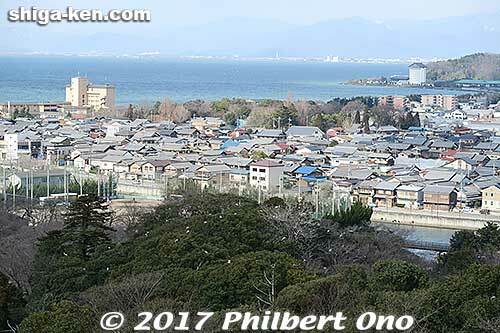 About Hikone – Overview of the city of Hikone. Goggle map of Hikone – Main sights listed. 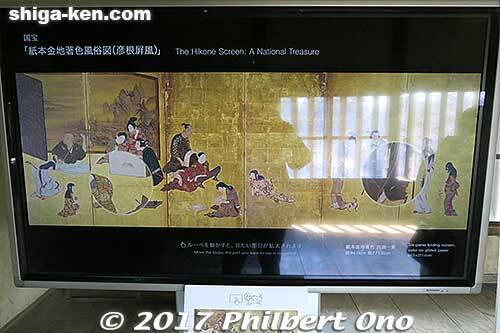 Hikone Byobu folding screen – Detailed look at this National Treasure. Hikone: A Journey in Time (manga review) – English manga (sold at Hikone Castle museums) about Hikone’s feudal history and cultural sights. Too many spelling and grammatical errors though. 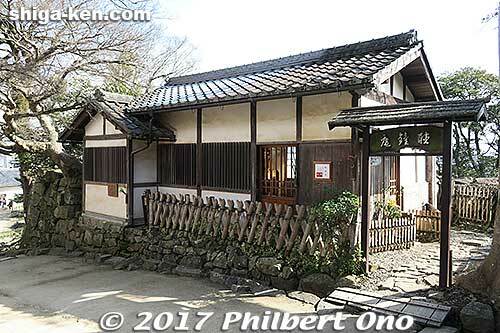 Iinoya (Ryotanji temple), Hamamatsu, Shizuoka – Childhood home of Ii Naomasa, first castle lord of Hikone. Gotokuji temple, Setagaya, Tokyo – Ii Clan’s family temple. Six Hikone Castle lords including Ii Naosuke are buried here. Also the home of the beckoning cat (maneki-neko) on which Hiko-nyan is based. Kamonyama Park, Yokohama – Park dedicated to Ii Naosuke whose efforts opened Yokohama to the outside world. 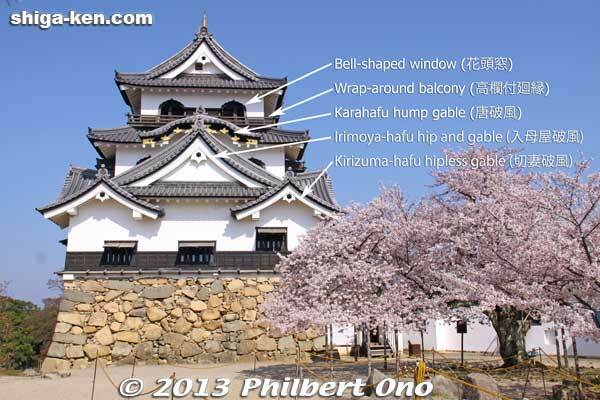 Hikone Castle video (embedded below) – Comprehensive 34-min. video about the castle, its history, Genkyuen Garden, and autumn castle festivals. 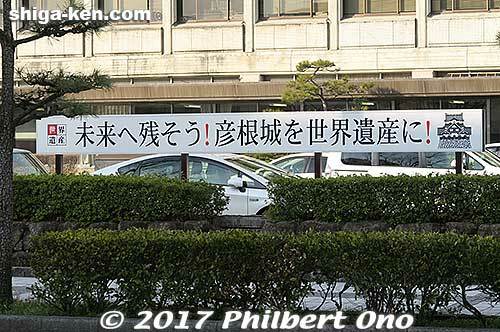 Sign in front of Hikone City Hall pushing Hikone Castle to become a World Heritage Site. 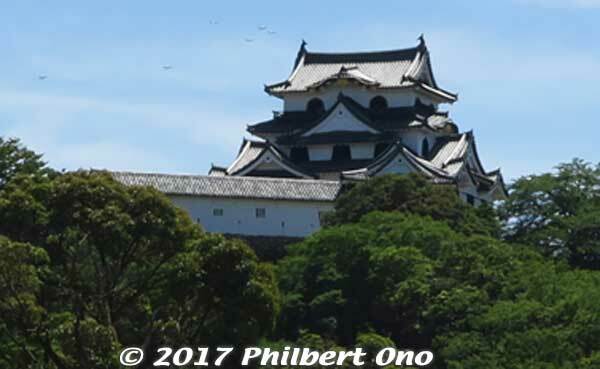 Hikone Castle has languished on UNESCO’s Tentative List for 25 years since Japan first nominated it in 1992 for World Heritage status. Spelling errors on a “clear file” folder.